As I am sure you are all aware, there has been a great deal of turbulence in the education system recently, particularly with regard to post-16 courses. 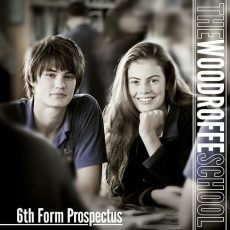 The aim of The Woodroffe Sixth Form is to enable students to navigate the changes successfully and with confidence, and as a school we have worked hard to ensure that we are able to offer a curriculum which is both varied and sufficiently flexible to accommodate the needs of the vast majority. The Sixth Form at Woodroffe opens doors to every possible type of university, employment or apprenticeship opportunity, and helps students decide on the best possible route forward to achieve their ambitions. At Woodroffe, no one is more ambitious for the students than their teachers. This year, students will have access to a number of routes through the Sixth Form. Most A Levels will move to the linear system (i.e. one examination at the end of the course rather than the old AS/A2 pattern) and this will allow considerable choice in terms of subject combinations. In addition to the two-year linear A Level courses, we are also offering a variety of one-year AS only courses to enable genuine breadth of study and real enrichment opportunities. The majority of students will opt for three linear A Levels plus one AS Level, or, for example, the Extended Project Qualification. There will still be the opportunity for those seeking a challenge, however, to take four A Levels and one AS as well if they can cope with the workload (and many of our students can!). Others might opt for three A Levels plus an enrichment AS, or a combination of one of our BTECs, A Levels and one AS enrichment. We will also continue to offer a Level 2 BTEC pathway and re-sits in English and Maths for students who scored below a 4 at GCSE. For those who opt for the linear A Levels, we intend to carry out rigorous examinations, akin to the AS examinations, that will be internally moderated and assessed and act as the indicator of a student’s suitability for progression to Year 13. By doing this, successful candidates will still have the opportunity to choose their best/preferred subjects on which to focus in Year 13 thus allowing them to keep their options open and to achieve the best results possible.